How to Improve Your Scrabble Score in 10 Simple Steps - The Word Finder Blog! Scrabble has always been a classic favorite for game night, and has grown in recent years with the ability to play on your mobile device. It requires the ability to form legitimate words with only the seven tiles given to you. Often, it is difficult to form words that will give you a high score, as scoring well does not happen easily. With the following tips, you will never have to enter a Scrabble game feeling unprepared. Read below to find out how to improve your Scrabble score, impress your opponent(s), and even become a professional Scrabble player! For more tips on Scrabble or Words with Friends strategy, check out Breaking the Game; A website devoted to word game strategy and provides tips written by one of the best Scrabble players in the world. There’s also a book on Scrabble strategy available here which comes highly recommended for anyone who wants to learn more about Scrabble strategy! Sometimes you don’t need to play long words in order to score high. Words with just 2-3 letters can often be overlooked. When used correctly, these small words can earn you lots of points, so learn them! For example: AX and HE are common two letter words while JO, XI, XU, QI are less common, but can score high! In addition, sometimes you will need to hook onto a 2 letter word to make your original play work. In the example below, knowing that OE is a word helps you play the word FIRE and earns you points from both words in one play. Make sure to brush up on these 2 letter words before starting your next Scrabble match! It’s important to understand how to use common prefix’s and suffix’s, as they can help to improve your score. Prefix’s and Suffix’s are words or letters placed before or after preexisting words to create new ones. By adding endings such as -ING, -ED, -ABLE, and -LY, or beginnings such as -UN, -DIS, -RE, and -PRE, you can use letters when you don’t have other plays. In addition, you can use a hook to complete a prefix/suffix while spelling your own word. 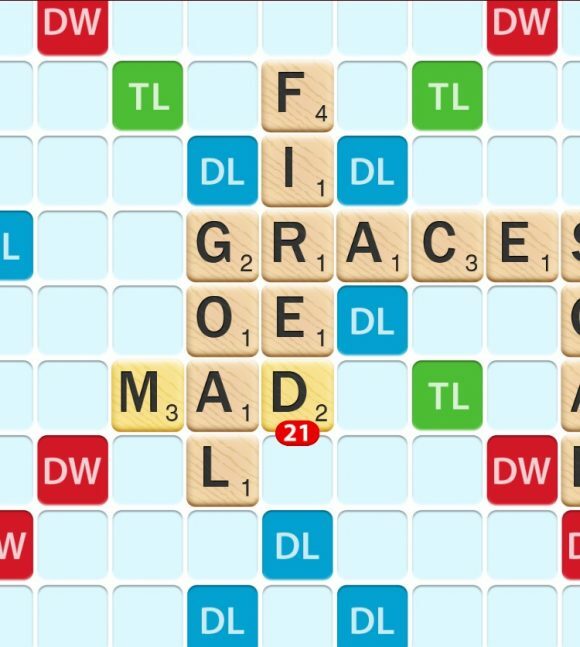 See in the example below spelling MAD and using the suffix to complete FIRED. It results in a 21 point turn from only playing two tiles. This is a simple yet effective tip that can improve your Scrabble strategy. Like with most projects, it is sometimes beneficial to look at things from a different perspective. Its helpful to do this in Scrabble (or Words With Friends too)! 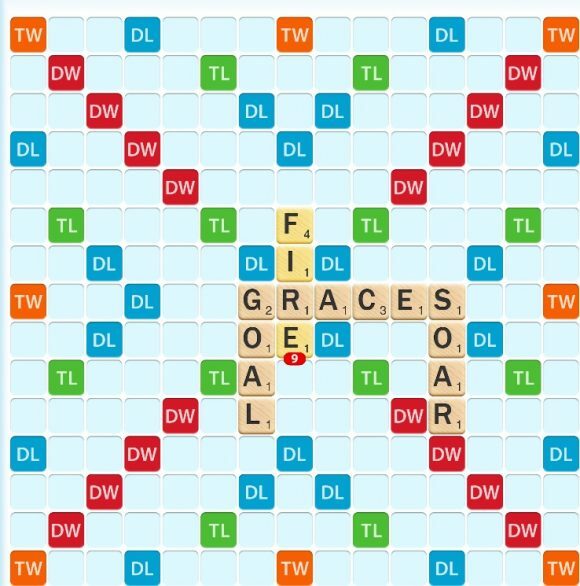 It may sound simple, but by rearranging the letters that you have on your Scrabble rack, you may be able to see words and combinations that you weren’t able to before. Hint: If you want to see all of the possible combinations, head over to our scrabble word finder page. Having a defense strategy is essential! While playing Scrabble, you should always be aware of the opportunities that your opponent has. Always be looking out for the ways they can score high, and try to prevent it. 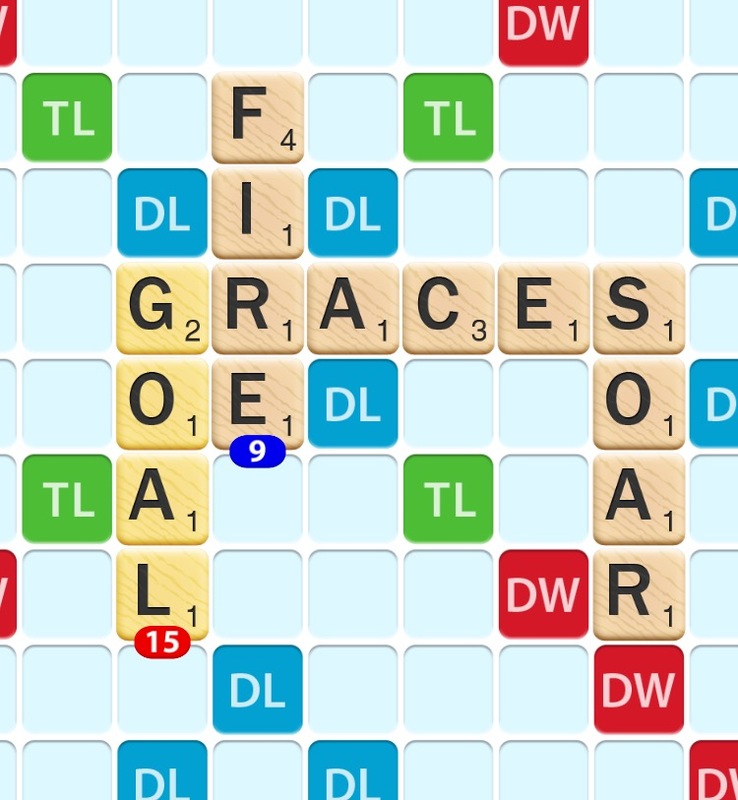 For instance, try not to make it easy for your opponent to use a triple word tile. Or if you know your opponent has a high value letter such as Q or X, you can prevent him from using it easily. This may mean having to play low scoring words so that your opponent does not score high. This is a sneaky tip that your opponent may not be aware of! In addition the suffixes listed above, simply add the suffix “S” to an existing word might make it plural and a good play. Be careful though, you want to use your “S” tiles wisely. Scrabble only contains 4 “S” tiles. Because of this, you will want to make sure that you use your “S” when it will gain you the highest score. 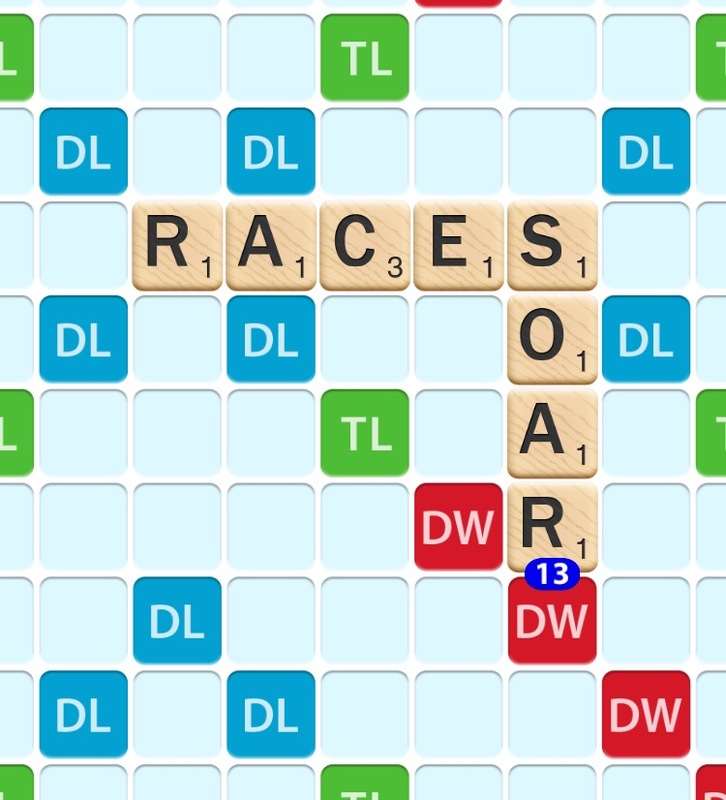 Often this comes when you can build off the S in the same turn and earn points from both words as seen in the example below by adding onto RACE with the S.
If you haven’t heard of hooks before, they are single letters than are often added to already existing words on the board in order to make a completely new word. For example, some popular hooks include turning “HOST” into “GHOST” by just adding a “G”. Other examples would be turning “DEAL” into “IDEAL” by adding an “I”, Turning “LUSH” into “BLUSH” by adding a “B”, and so on. In the example below, you can see how we turned RACES into GRACES and score points for GOAL in the same play. It is important to keep an eye out for these, as they can also boost your score. Learn new words. This could possibly be the most important and most obvious tip that not only is beneficial to your every-day life, but to your word game strategy as well. As simple as it sounds, it can be very helpful while playing Scrabble (and Words With Friends). Learning new words will expand your vocabulary. By doing so, you will have more opportunities, more words to play, and a chance at a higher Scrabble score. As most players know, “Q” is the highest scoring Scrabble letter. Words that contain the letter “Q” usually are followed by a “U”. Since there are only 4 “U” tiles in Scrabble, it is unlikely that you will have both a “Q” and “U” at the same time. Therefore, it is important to know words that contain a “Q” without a “U” that follows it. There are not many- so memorizing them can be easy. For example, a few include, “QING”, “QINTAR”, and simply, “QI”. If possible, try to head towards the bonus squares from the beginning of your game. Bonus squares are easy ways to boost your score and you can strategize these bonus spots to open up when it is your turn. Note, combining bonus square is even better; For example if you have a word that hits on 2 double word score tiles, you get 4 times the score instead of just double! Did you know that if you use all 7 of your tiles in one play you earn 50 extra bonus points in addition to the points scored from your word?! This bingo bonus while challenging to do, its not as uncommon and difficult as you may think! In addition, it is important to remember that the points from your tiles that you own at the end of the game are subtracted from your score. Don’t get stuck holding onto a high point letter like Q or Z at the end of the game. Alternatively, if you know your opponent has a Q, try to block him from playing words like QI which is an easy way for him to dispose of the Q. 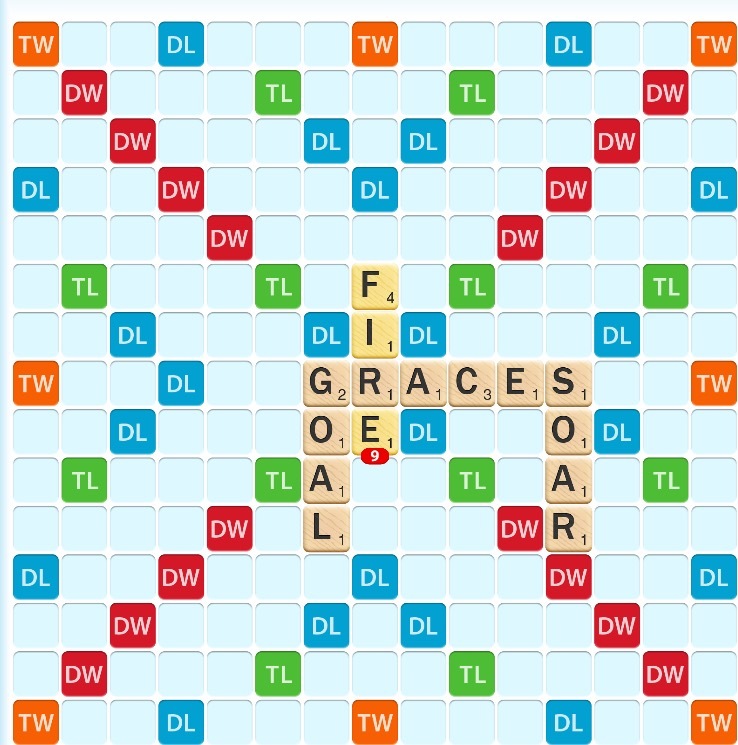 A separate rule that people forget about is that if you use ALL your letters before the end of a game, you get each of your opponents tile points added to your score. This can be huge especially in a 3 or 4 player game of Scrabble. Needless to say, there is a big point advantage to finishing your tiles off early in a 3 or 4 person game of scrabble. Remembering these often forgotten rules can be rewarding to your score! Scrabble will always be a classic favorite! The game requires you to use a combination of knowledge, language, and strategy to get the highest score. While it is a fun, lighthearted activity that is a great way to pass time, it can be even more enjoyable if you continue to improve your game. Keep these tips and tricks in mind next time you decide to play a rousing game of Scrabble (or Words With Friends). If you find yourself having a hard time finding any word that works, you can use an online resource such as thewordfinder.com to help you unscramble and find words from your 7 tiles. It is always okay to get a little help when you are lost, so let The Word Finder lend a helping hand! You will note that this process may even help you in future games when you don’t have access to such resources. Whether you are playing with family or friends, you will be sure to impress them with your new Scrabble skills! Good luck!